Human beings are wired to see color as the first thing that pops into their eye. Not form, material or depth, but color is the first visual component we process. It is immediately registered in our brains. The origin of this process lies in our evolutionary needs. As nomads we needed to be able to read the landscape. We had to distinguish ripe berries from the ones that had gone bad, red was associated with danger and fire, and so on. Felines, on the contrary, see movement before they see anything else, as they need it more than color to hunt and survive. Fast forward to the present influence of color on humans. Many studies have been conducted to show how consumers are influenced by the effects of color. In previous blog posts, we explained how color is perceived, as well as the mood color provokes. But what do consumers expect when they see a certain product linked to a certain color? What grabs their attention? What will win their trust? What will push them to buy? Theoretically, the impact of color can be explained in one simple graph. 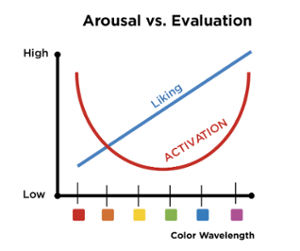 The graph demonstrates that warm colors, such as red, orange and yellow, activate you more than the cool colors, such as green, blue and purple. The latter are more calming and rational, while the former create more spontaneous reactions. Activation rises again when evolving towards magenta, as the color circle comes back to red. The most popular colors are blues and indigos, warm colors are less successful. More in detail, the intensity of the color can greatly impact the effect of the color. Energetic and fully chromatic colors have a stronger and more direct impact than discrete pastels or greyed colors. It all depends on how you want to approach your customer. However, in reality, many more factors are at play. We need to consider age and gender and take into account what setting and sector we are operating in. Needless to say, findings considering color also differ greatly in various geographical areas. With the Color Navigator System, it is now possible to map out a color dashboard for your product, brand or company, which is perfectly adapted to your target group. Color combinations allow you to create depth and movement. To create an interesting story, using color comes down to 1+1=3. On the one hand, you can opt for a harmonious color palette, on the other hand you can purposely make bold color choices in order to create contrast. Finding the right appearance for your product, brand or company is often based on gut feeling, but can now be supported by the Color Navigator System, which offers a scientific explanation for all your color decisions. Interested to see how Color Navigator can help you make the right color decisions? Feel free to contact us. Source: The two-dimensional impact of color on shopping (Marketing Letters January 1993, Volume 4, Issue 1, pp 59–69). Image graph © Color Navigator. Image header © Justin Lim.